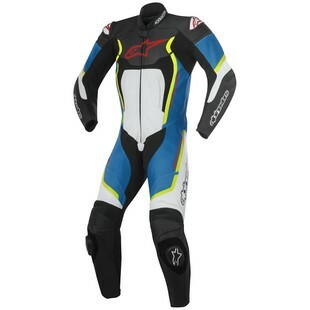 The new Alpinestars Motegi v2 Race Suit is the newest refinement of the Alpinestars entry level leather suit. Throughout its iterations the suit has slowly been coaxed into something much more track worthy. The Motegi v2 One Piece Race Suit is technically the third version of the suit and it is true what they say. The third time's the charm. The v2 suit continues to have premium 1.3 full-grain bovine leather, removable CE protectors, and a removable mesh liner from the previous version. New stretch panels, an updated collar, and a tweaked mesh liner design make this new release much more than a style update. The Motegi v2 One Piece suit is the baseline option in Alpinestars leather suit line up but it will tackle the track or carve through canyons with the best of them. Rome wasn't built in a day and the new Motegi v2 One Piece leather suit took three tries to get to this point. If you are considering getting into track days then you should consider getting into the new Motegi suit.